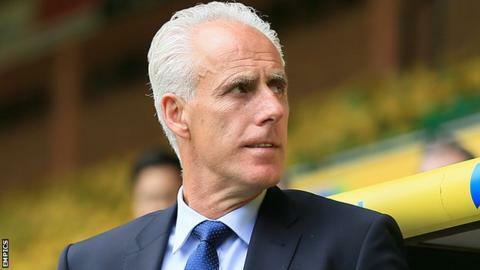 Ipswich Town manager Mick McCarthy says there will be no "knee-jerk reactions" after losing their last two matches. After winning three of their first four Championship games, Town have lost 3-2 to Brighton and 5-1 to Reading. "When you've conceded eight goals in two games, I've said to them all positions are under threat," he said. "But I don't believe in knee-jerk reactions because if you do that and somebody else doesn't do well you have to go back to plan A." He told BBC Radio Suffolk: "If plan A is alright and has worked for a long period of time then keep with that. "I'm not one that changes people for the sake of it, because each one of them were hurting and as embarrassed as I was the other night. "None of them let me or the club down intentionally, it was just a bad day at the office and we all have them." Ipswich fell out of the Championship play-off places as a result of the heavy defeat at the Madejski Stadium, but McCarthy is sure that his team will be back to form soon, with Town travelling to Leeds on Tuesday. "I don't see that too often, I came on straight away and took a bit part of the responsibility for that, for the team I set out, we were a bit open. "We should give Reading a bit of credit though. When they broke, they were clinical and punished us," he added. "There were goals we wouldn't concede normally, crosses into the box with one striker beating two defenders. Those defenders have been outstanding, so I don't see it as a problem - they'll be back to their best again."